This traditional recipe is a family favourite especially during a feast, served with soft sannas or appams. For Grinding Masala Ingredients: Roast each seperately before grinding. 1. Clean and chop meat to 1 inch pieces. Put in pressure cooker with onion, crushed ginger, slit green chillies, vegetable stew powder, toor dal, and chopped tomato. Add a cup of water and 1 tsp of salt and pressure cook on a low- medium heat for 4-5 whistles. Allow the pressure to drop before opening the cooker. 2. Meanwhile as the meat is cooking roast all the masala ingredients seperately in a little oil till aromatic ( except tamarind) and keep aside. Once cool grind along with tamarind and a little water sufficient to make a thick but fine paste. Rinse the mixie in 1/2 cup water and reserve liquid for gravy. 3. In a large vessel place chopped polov ( 1inch pieces) add 1/4 cup water, a pinch of salt, and cook on medium heat till firm but cooked. 4. Add the masala to the meat in the cooker, stir gently bring to boil covered with a lid. 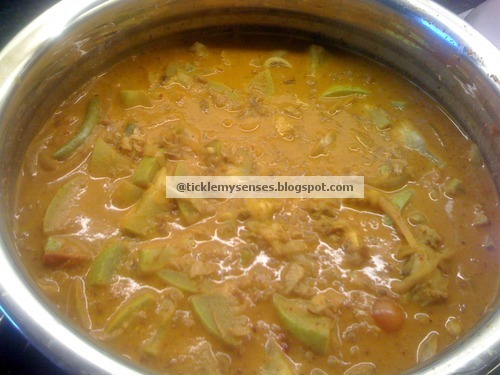 Add the strained and cooked polov and 1/2 cup coconut milk, taste for seasoning, add salt or tamarind as required, cover and bring to boil again. Then turn off heat. 5. This step is optional but add good flavour- In 2 tbsps oil/ ghee( for authentic taste) fry 1/2 sliced onion till brown, then add 3 large flakes of garlic and 3 tbsps grated coconut and fry till brown. Add over hot curry. 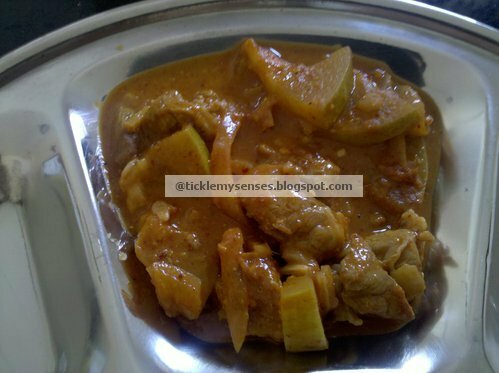 Tasty mutton pulov curry is ready.